As any woman who has ever wrestled with a round brush and a five-pound hair dryer knows, you’re only as good as the tools in your arsenal. That’s why we tapped our top beauty minds to find the best, highest-performing hair dryers on the market. Happy styling! Drybar is the master of blowouts, so obviously it knows what it's doing when it comes to bringing the heat. This dryer’s three temperatures, two-speed settings and super-wide nozzle are perfect for cutting down drying time on thick locks. Looking to pump up the volume and boost shine? Let this high-torque, ultra-lightweight dryer be your saving grace. It’s a tad pricey, but when the technology promises to be healthier for your hair than air-drying, who are we to complain? The ceramic technology on this 2000 Watts dryer delivers Far-Infrared Heat that warms from the inside out, basically drying your hair without leaving it completely fried. It’s great for all types of hair, but if your strands are damaged, you’ll be sure to benefit from it the most. This dryer redefines everything you know about hair drying. Twist the nozzle to the classic horizontal mode for up-close root drying, or use the vertical mode to activate targeted air jets at specific sections (front and back). It won’t leave your hair super-straight, but if you like things wavy, this is definitely your best bet. 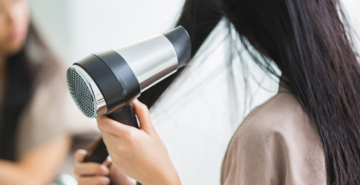 With 1875 watts of power and an ion option that smoothes the curliest strands, there's a good reason why the original Harry Josh Dryer is a go-to for so many celebrity hairstylists. And now that the new lightweight version is here, coming in at just under 1 pound with 12 heat and speed settings that quickly minimize frizz and promote softness, we’re sure it’ll be your new at-home favorite. The price tag isn’t for the faint of heart, but if you’re looking to style quickly and sleekly, while cutting down on frizz and damage, this is your guy. The digital motor dries hair six times faster than an average dryer while the thermal sensor measures temperature 20 times per second to make sure it’s not frying your locks. We’ve seen this thing do silky wonders on even the frizziest of 'dos.